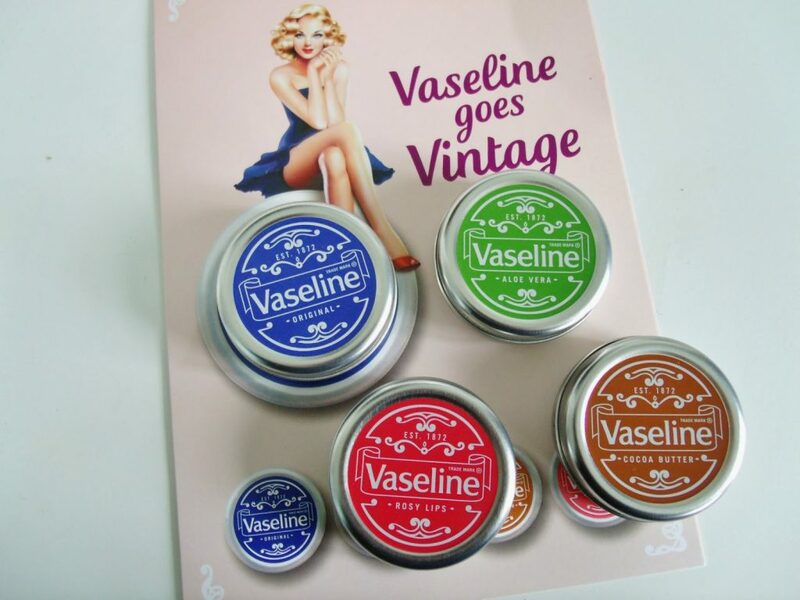 Vaseline has been a staple of womens make up bags and keeping lips protected and healthy for over 140 years now. And now their iconic tin design has had a retro make over! The new Vaseline goes Vintage collection is now more glamorous than ever, and includes the four favourites; original, aloe, cocoa butter, and rosy. The cult Classic tin is always there to help heal and repair dry and chapped lips, to keep them hydrated and smooth. The green aloe vera tin contains cucumber extract and pro vitamins to keep your lips fresh and moisturised. Possibly my favourite, the cocoa butter tin smalls delicious and is the ultimate indulgence; enriched with cocoa butter to keep lips kissable and soft. And finally, the glamorous pink tin has a subtle cherry hint of colour, to enhance the natural glow of your lips, and includes sweet almonds and rose oil. 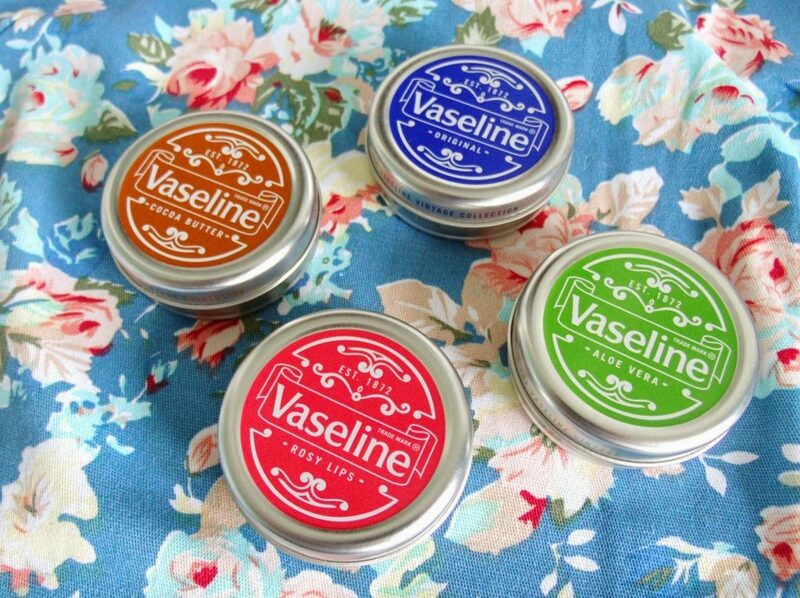 I took part in the Vaseline challenge to create a vintage inspired beauty look using the Vaseline Vintage Collection. 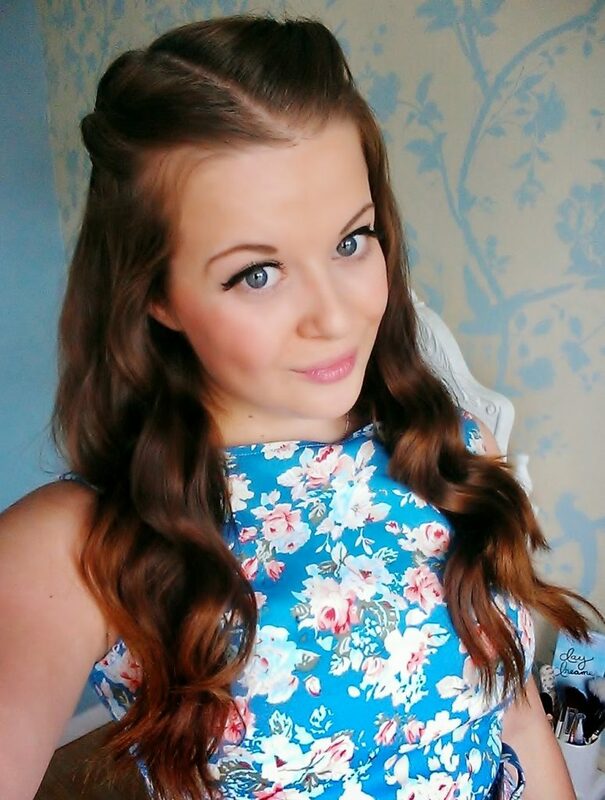 I thought this would be the perfect opportunity to show off my beautiful new retro floral dress from Lindy Bop. They sell a huge range of beautiful vintage style dresses with different styles to suit any body shape. 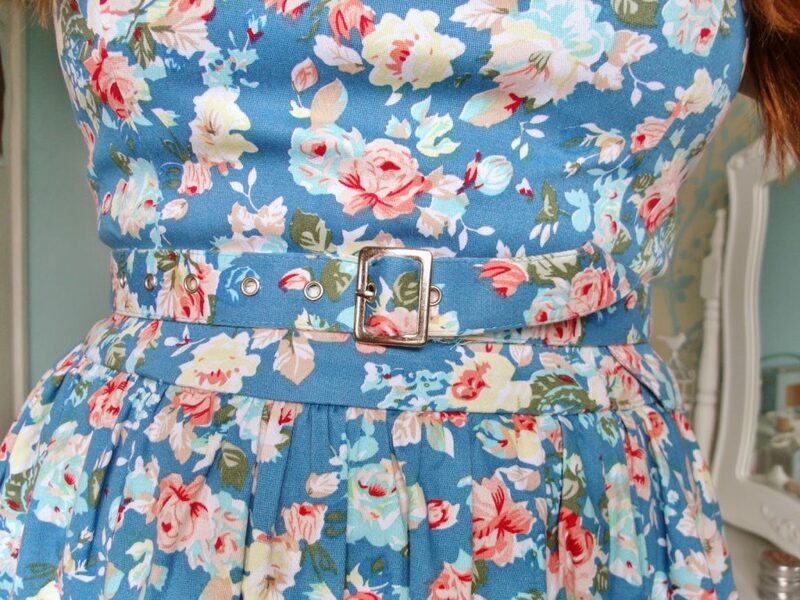 I was kindly sent the stunning Audrey Hepburn style vintage 1950’s sky blue party dress, with gorgeous spring garden print. The adorable dress has a nice wide flared skirt to give the perfect retro feel. The bodice of the dress is fitted and has a high cut neckline, and it also comes with a little waist belt to hold you in too. It’s the perfect vintage party dress and I hope I have an occasion soon when I can wear it out! Christmas perhaps? To create my Vintage Vaseline beauty look, I used the rosy tin on my lips to keep them glossy and pink, and also used a pink blusher on my cheeks. To enhance the vintage look, I used some long false eyelashes and used liquid eyeliner to line my top eyelid and drew on a flick towards the end. I used my waving wand to create bouncy curls in my hair, and simply used kirby grips to hold in place the twists towards the front of my hair. 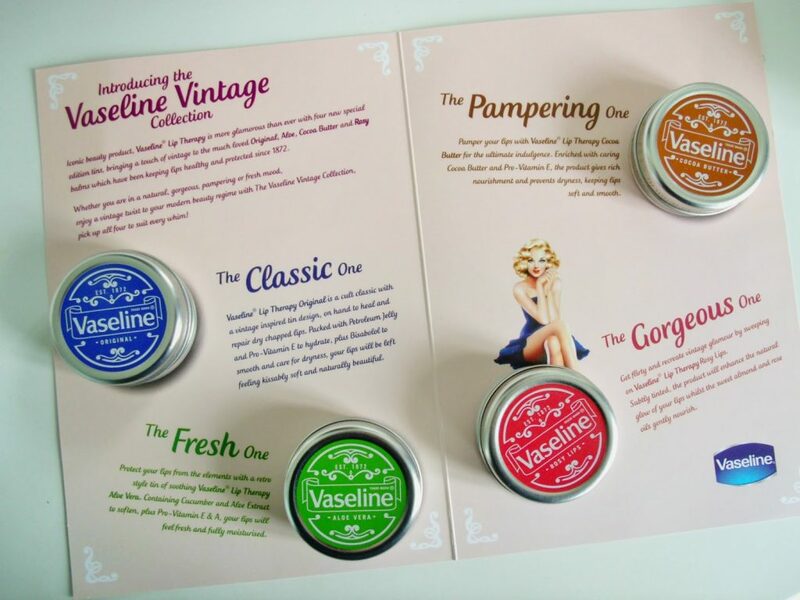 The new Vaseline Vintage Collection is special edition, and available now with an RRP of £1.45 for original and aloe, and £1.94 for cocoa and rosy. Sorry for all the posey photos.. I really like this dress! I love that dress! 🙂 and the vintage designs are so cute. My favourite is the Rosy Lips 🙂 Moisturising with a nice tint at the same time = Perfect! Your dress is beautiful, you look amazing in your photos. And those tins are so pretty- will look out for some of them! your dress is gorgeous hun! Love you blog! This dress is so cute, love it! That dress is absolutely beautiful, I love the pattern and style 🙂 Your hair looks beautiful like that too. That is a beautiful dress. 🙂 I think I'll definitely be buying one of those vaseline tips.. too pretty! That dress looks perfect on you!